I am selling spare parts for vintage Volkswagen since mid of the 80s and I am kind of familiar to the VW-number system in a way that enables me to know the good selling items by their part number and if I don´t know the number exactly, I find the correct number normally in old VW spare parts books quickly. This does not mean I am exceptional brain artist, but the VW-number system is so logical, it really makes identifying the parts pretty easy. Whoever invented the VW-number system in 1953 was a genius. Back in these days VW just had two different cars: beetle and bus. But even today this old number system still works for Volkswagen and its huge variety of different cars and models. But even based on this brilliant number system I was never able to learn this damned Bus chassis parts: rockers, jack supports, brackets, rails …. front, rear, middle, outer, inner… I never got it and always felt as being an idiot, cause it was too complicated to me. But now when the gearbox is removed from the poor rest of our Samba´s chassis there is finally the time: I HAVE to learn it, just because I have to know what we need for the reconstruction of the chassis. I was in a need of a plan. So when today´s Sunday office work was done I stayed two extra hours in the office, reading, comparing, investigating in my 1954, 1957 and 1967 vintage VW Bus spare parts books, the websites of several British sheet metal producers, the Wolfsburg West catalog and the current issue of Airmighty with its feature of Claus Missing´s brilliant 1953 Barndoor panel. In this article there is a big picture of Claus´ Bus from underneath and this picture was finally very helpful. 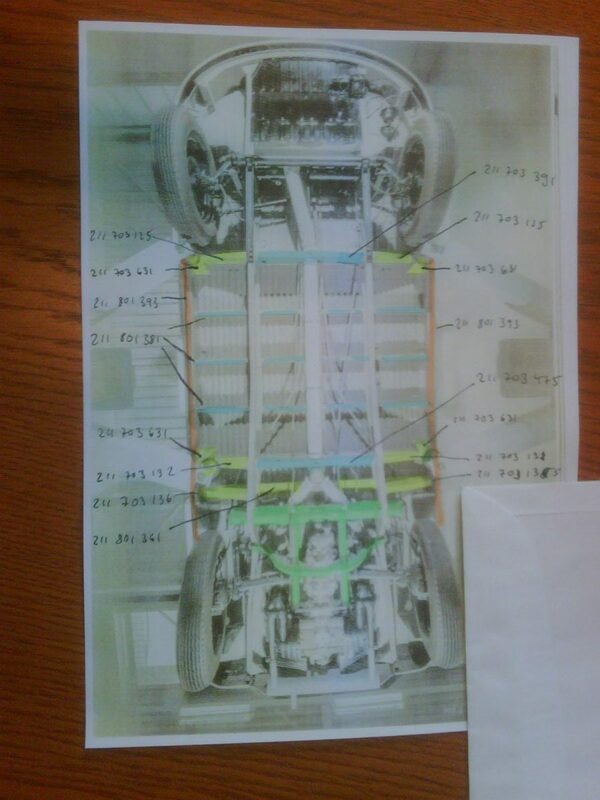 I copied the picture and marked the chassis parts in different colors. Green for the sections which are still good and different other colors for the different producers´ parts. 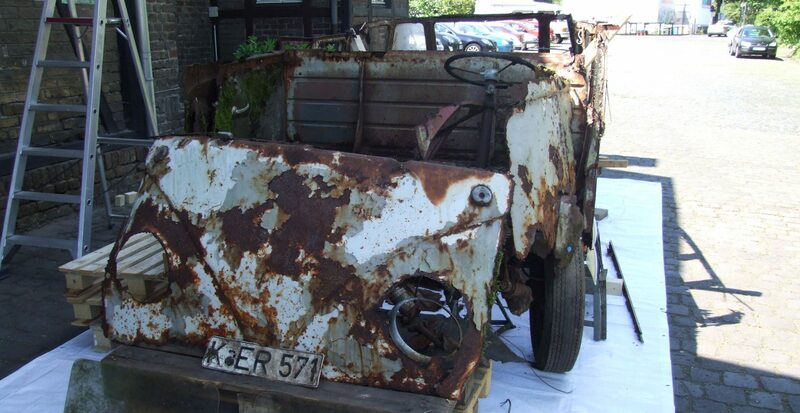 Of course there is a lot Barndoor specific which doesn´t make getting the parts easier. But in the end I found that I can get everything we need for the reconstruction but the floor pans itself. Some of the parts we even had already in our VEWIB-line –and I didn´t know it. All other parts I ordered not only just one of each for our Samba, but a complete load to add all this parts to the VEWIB-line. So, if you are doing a Barndoor restoration yourself, we got everything for your chassis in line now. In the meantime when I wait for the chassis parts to arrive, I will have a close look to the front end of the chassis. In case I find some time in the next week, I will remove the front axle to check what is left of the bulkhead. We will see and I keep you posted. ⟵Shocking: one of the Samba´s technical components still works!